First released by Gusto as a 2 LP set in the seventies, this collection presented 30 (well, 29) classics from the legendary Starday-King catalog. It has since become a sort of a classic in itself, as it's never been to hard to obtain. It has probably appeared in every format, eventually even CD. The only real flaw in the collection was that it included the same recording twice under two different titles. Tommy Jackson's "Cotton Eyed Joe" appears as track 15, and then reappears as "Fiddlin' Joe" at track 25. Therefore, for this post I have substituted "The Original Jole Blon" by Harry Choates as track 25. It was taken from the LP set "Country Music Hall Of Fame", Starday SLP 164. 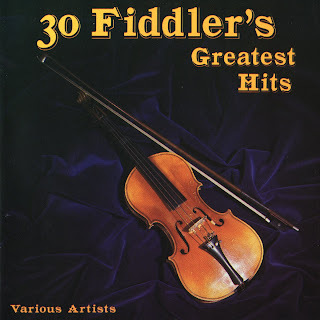 This is a really important collection of southern fiddle tunes. Some of the LPs this material are drawn from have (Fiddlin' Arthur Smith) and will (Chubby Wise) be featured in their entirety at the Attic, but there are many great recordings here that are otherwise hard to find. Enjoy!